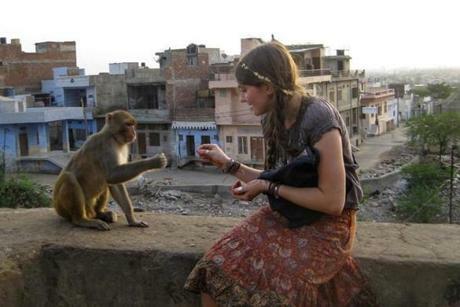 Through some marvelous coincidence/confluence/coordinance (is that even a word? 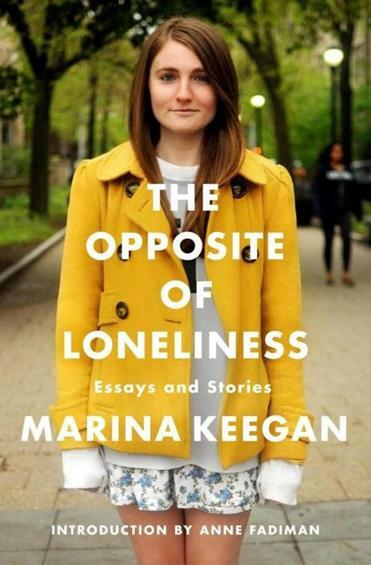 ), two – count ’em, two – pieces about Marina Keegan’s book The Opposite of Loneliness ran in yesterday’s Boston Globe. Start with Joseph P. Kahn’s Page One feature. Now comes a collection of Marina Keegan’s essays and stories, being published this week by Scribner. Titled “The Opposite of Loneliness,” after the essay that brought Keegan worldwide attention, it marks a bittersweet milestone for the author’s family, friends, and academic mentors, all of whom have struggled with her loss. And yet, they say, what a gift Keegan has left behind. Not only in her written words — she also wrote plays, poetry, and literary criticism — but also in her legacy of social activism and fierce belief in leading a life of purpose, not privilege. That was the challenge laid down to her Yale University classmates in “Loneliness,” and it has powerfully resonated ever since, according to many close to Keegan. It certainly resonated with the same day’s G section of the Globe, which featured this piece by Sophie Flack. In yesterday’s Boston Globe, at least, Marina Keegan had a lot of possibilities. This entry was posted on Wednesday, April 9th, 2014 at 9:48 am and is filed under Uncategorized. You can follow any responses to this entry through the RSS 2.0 feed. You can leave a response, or trackback from your own site.